If your EMR is OpenEMR or one of its many flavors, talk with your vendor - you can start sending SMS, email and voice messages to your patients today! Send appointment reminders using SMS, e-mail and automated voice calls. We start you off with pre-made templates which are fully customizable. After that, your EHR handles the rest behind the scenes, every day. It is all automatic! MedEx adds: "Press 1 to confirm, 2 for a callback from our office, or 0 to hear more options." Did the patient confirm or do they need to reschedule? Did the message end up on an answering machine? Does the patient want to opt-out of a certain type of messaging? Answer: MedEx handles this for you in the background. Consider this scenario: MedEx sends out your SMS reminder. Instead of responding with "C" to confirm, or "P" for a call from the office, the patient starts typing out a message to the office! We've got you covered! 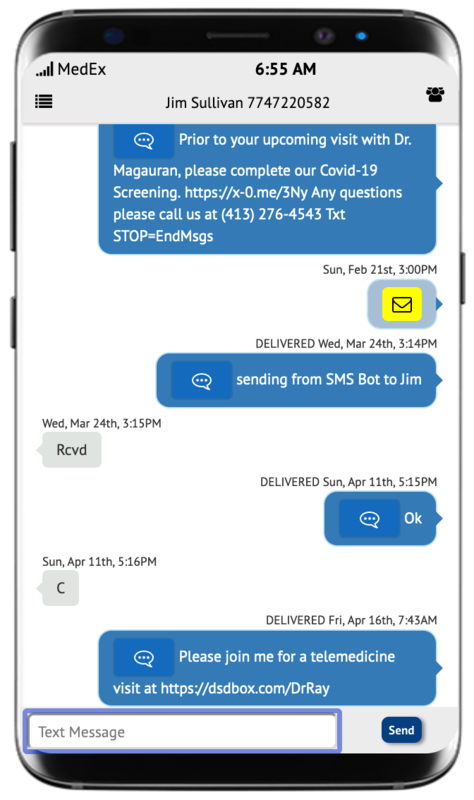 We'll alert you that there is an "incoming message" and using the SMS Bot© from inside your EHR, your staff can text them back and forth to your heart's content. Please remember, the SMS Bot uses real SMS thorugh phone providers. Texting in general is not HIPAA compliant. It's OK to send appointment reminders by text but don't disclose any unneccesary protected health information. The MedEx SMS Bot© is good but it is not smart enough to enforce HIPAA compliance... Please take the time to periodically review the Dos and Don'ts regarding HIPAA with your staff. A communication campaign is only effective when the message is received, and desired. Patients control their messaging preferences. From the initial encounter with a patient, ask about and record their messaging preferences in your EMR. MedEx honors these preferences. If a patient does not want to receive SMS messages, SMS will not be sent. Preferences can change! Every message contains an opt-out option and if selected, MedEx will update your EMR directly. 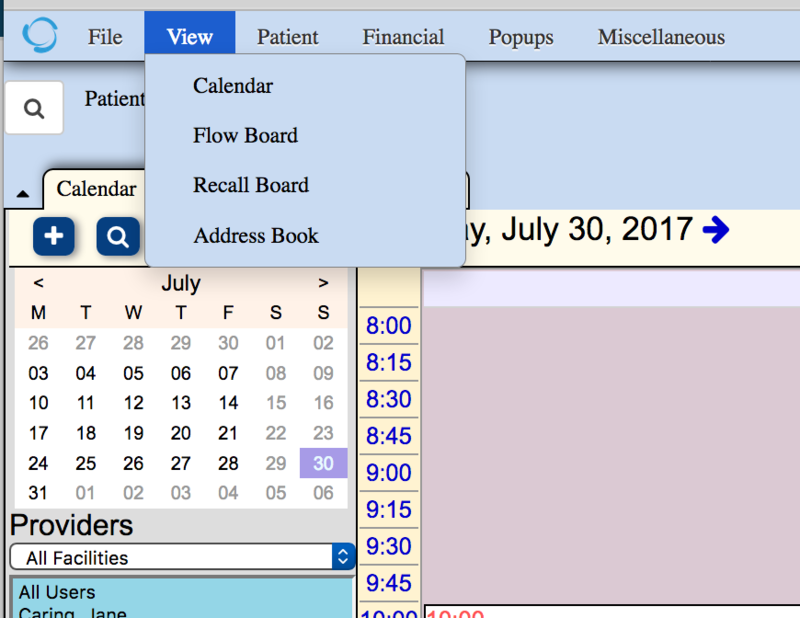 MedEx added the Recall Board to OpenEMR starting in version 5.0.1 - for patients needing appointments in the future who do not have one scheduled. With a Medex subscription, the Recall Board starts sending out its own Recall Messages, on its own unique schedule with unique message campaigns - just like Appointment Reminders, but totally separate. The MedEx-enabled Recall Board will display the progress of your Recall messages campaigns, just like the Flow Board does for Appointment Reminders, but for patients who need to schedule. Ask patients about their preferences on check-in or check-out. We're working on adding new features to expand your palette of messaging options based on provider, facility location or appointment types. 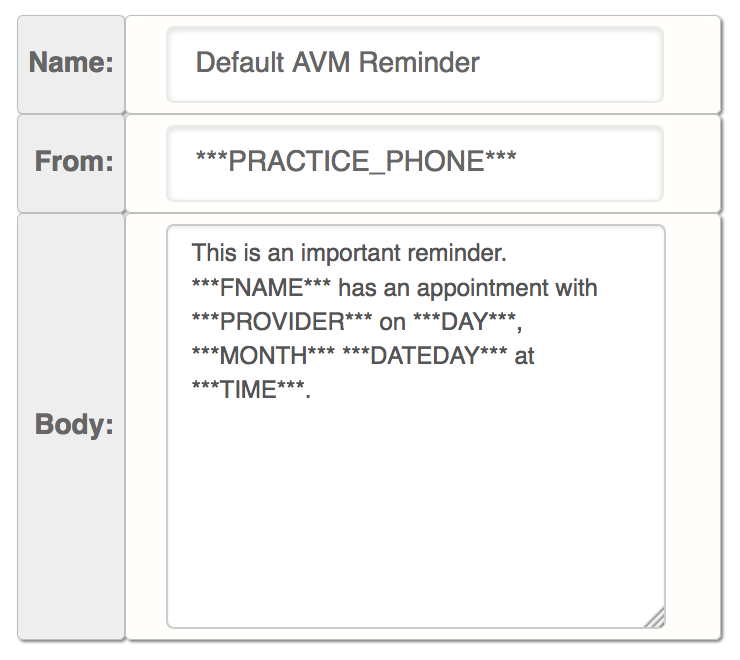 Integrate MedEx and OpenEMR Clinical Reminders(beta). Dial "0" to reach the office now (alpha). Imagine sending out a CAHPS® Clinician & Group Survey v3.0 to every patient? Analyze the results to improve your practice and you can attest to an Improvement Activity for MIPS (Activity IA_PSPA_11: Participation in CAHPS or Supplemental Questionnaire, Activity Weighting: High). This alone will qualify a small practice for the max MIPS IA score of 40 points! Would you like to send a message to all new patients visiting Dr. Smith at the satellite facility? We've added this. How about linking text messaging into your Patient Portal? We can organize that too. Do you send out reams of paper to new patients? E-mail them in an automated fashion today with Go Green Messaging. What about automatically sending out patient statements, either as paper or via your Portal? Connecting with patients is no longer just a desired feature, but through MedEx you'll be able to do it on your patients' terms. Come grow with us!